You are difficult with job : how to create a mobile app for own magento store. Understand how SimiCart helps you create magento mobile apps without any coding skills. 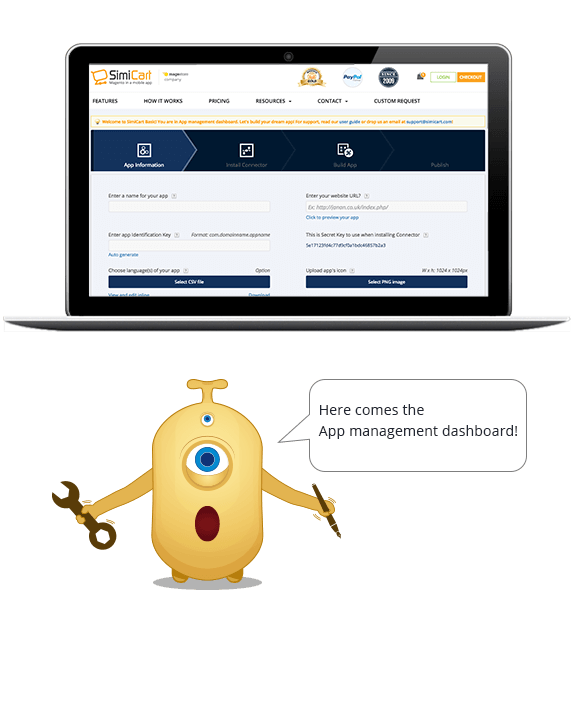 Once you purchase (or register a free account), you will be directed to App Management Dashboard, where you can build and manage your apps. There are 4 steps in total in the dashboard, which normally takes you 10 mins to finish. Here, you will find Connector, all plugins you purchased and of course, their own user guide. Please follow them to install and configure your app. *Please note that the connector of Free and Paid versions are different. Now, you can start building your app. The app built in this step is called test app, which means you can test it on your mobile devices. If you are not satisfied with it, back to step 2 to configure and then re-build another. Then move to next step when it is good. It's time to publish apps to Apple Store and/or Google Play. You can choose to have SimiCart publish it for you (+$50) or do it by yourself. Normally, it takes Google 2 days and Apple 10 days to approve your apps. One the approval is done, your customers can download the apps. Ready to get your own Magento mobile app in 10 mins for free? 3, If you want to use XMLRPC API then you have to download it's library and use it in your project. 4, You have to create a new user in your Magento Store with roles.That you can do by loging in to your Admin module and the option is under the system->Webservices->User && Roles,you have to create first roles and then create a user and assign the roles to the users. 5, You have to use the UserName and APIkey that you give in the Magento store for calling the login function. 6, Calling the login function , you will receive a session Id, that you have to store and use in your further call. Discover the rich feature-set which help have seamless experience on eCommerce store! MageMob Admin supports multiple store formats. Get results and reports based on your store selection. All the modules have smooth and easy pagination and listing options. You can simply swipe to go from one page to another. All modules have filtering options. For example, in Sales module, you can filter orders based on status and time. View all the details of the orders placed, including billing, shipping and product details. Get customer details along with the associated order details and interact with them through emails . Products can be easily viewed and managed on-the-move. It is equipped with enable - disable functionality as well. I really appreciate for sharing this information for building easily Magento mobile app. A person can also contact with one of the best web development company that will offer you high-quality Magento development services for attractive & 100% customizable e-commerce mobile app. Build your mobile app earlier and publish it. Last edited by Rainitit; 10-11-2017 at 09:45 AM. Developing a mobile app, especially on Magento platform is a tedious task. Thanks to MobiCommerce that created a platform to preview and publish a Magento Mobile App without coding. Simply launch your Magento mobile app as easy as 1->2->3->4. Ongobuyo is an M-commerce solution for Magento store owners to generate their own mobile application. Magento mobile app builder AUTOMATICALLY. At Ongobuyo, you can build iPhone and Android application synchronized with Magento store. FREE to start! Use SimiCart to quickly build shopping apps synchronized with your current website. Unlike our competitors, you can do this by yourself AUTOMATICALLY. And note that nowhere else but HERE you can build apps of awesome loyalty features that customers can't help but visit and purchase again and again. Customers can download your professional magento mobile app to their iPhone, iPad or Android devices (native apps). They will love to use your shopping apps because it takes them LEAST time to purchase! Doubt it? Just 1 minute to search products by scanning bar code, QR code, 0.5 minute to login by connecting Facebook account, then 2 minutes to check out quickly by auto filling GPS address. Let's build Magento mobile apps all by yourself! MageMob App Builder for Magento is a mobile app extension which helps you to build a custom mobile app for your Magento Store easily and quickly. Apps built with MageMob App Builder are optimized for both Android and iOS platforms and are mobile responsive. Magento Mobile App Builder gives you all the flexibility without the headache of developing your application from the ground up. Why Use Magento Mobile App Builder? Customers can access your Magento store from anywhere! Magento Mobile App Builder lets you leverage the power of m-commerce. 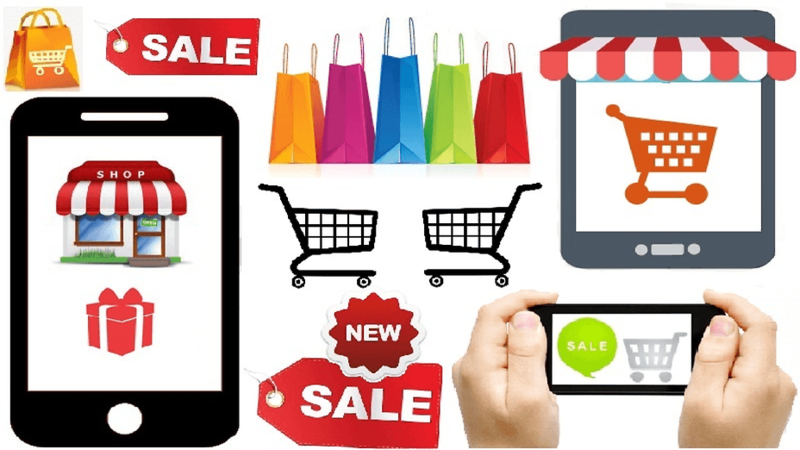 The app helps you drastically decrease the investment needed for developing and publishing Mobile App for Magento Store. MageMob App Builder helps increase your customer base, since your store can potentially be present on every smartphone. The user-friendliness and mobility increase the overall sales from your Magento store and makes your ecommerce business a success. You can have more contented customers by offering them flexibility of accessing your store from their iPhones & Android devices. Thanks for this information. I am here because I am looking for a good app for Forex trading. I want to make it from my smartphone. It was more convenient. I do it through AvaTrade from my computer. It is the best broker! It is a leading online forex and CFD trading broker that strives to provide a streamlined, user-focused experienced for its more than 200,000 global users. But I need some app for my smartphone. P.S. If you want to know more about this broker, you can read this article www.dailyforex.com/avatrade/avatrade-review/804 Try it! Magento is a popular CMS platform these days that is highly affordable and easy to use as well. If you are talking about the mobile app for Magento store then it could not be complete yourself. You should hire mobile app development Companies who could understand your business needs and deliver effective solutions accordingly. A pioneer mobile app development Company is able to identify the best business solutions that suit your products or service range completely.